We have been fans of bread making for a long time and if you like toast some might say it’s a necessity in France. Mostly I used the bread machine to make loaves for toast and my top tip is to have a big plastic box with a clip lid to keep your flours, salt and bread making paraphernalia in. This means it’s one thing to get out and the loaf is on in under 10 minutes. I also use the machine to make dough for pizza and burger buns. English muffins I make using a mixer with dough hooks (as it’s a wet dough) and I get my hands messy and do the whole kneading thing when I make foccacia. I’ve also been known to have reasonable success with brioche and hot cross buns but my bête noir has always been sour dough bread. 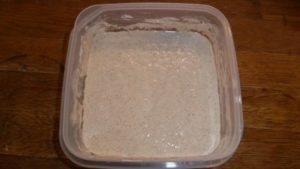 I’ve managed to generate a ‘starter’ and I have followed the detailed instructions from several books and websites but to say the bread was inedible was an understatement – you could have built walls with them! Enter Peter and Meghan from Canada, staying with us for a fortnight’s workaway. Peter is a baker who is travelling around Europe with his sour dough starter, he’s even been known to take his dough out with him for a day… This is a level of dedication to bread making that I’m not sure I’m prepared to go to but he did teach me to make very good, even if I do say so myself, sour dough bread (SDB) with very little hands on time. Don’t get me wrong SDB takes a long time from start to finish, but with this method each intervention is only a few minutes. Below I’ve tried to describe the method in layman’s terms. It does mean you need to be about for the day, hence Peter taking his out, but it’s probably only about 30 minutes hands on time all together. I have also learnt a whole new vocabulary, this is optional of course. Crust I was familiar with but I thought crumb was what was left on my plate when I’d finished eating. Well, apparently not, crumb is the bit inside the crust and with SDB the bigger the holes the better. Personally I think there is a limit but there is a famous bakery in San Francisco where the holes are so big they have to use another loaf to fill them in order to make sandwiches, I’ll settle for medium holes with the odd bigger one. The other thing I hadn’t realised is that bread can have ears, again the bigger the better. Ears what you call the crusty bits that stick out from where the cuts are made in the dough and have nothing to do with your bread’s hearing. I also learnt some technical terms and words such as autolyse but if you google them you’ll get the right answer. The only problem is that with my growing skill in sour dough bread making is also getting a growing waistline #goodlifeproblems! This is going to sound like a lot of faffing around but none of the stages takes more than a couple of minutes hands on time and it really does make tasty bread. 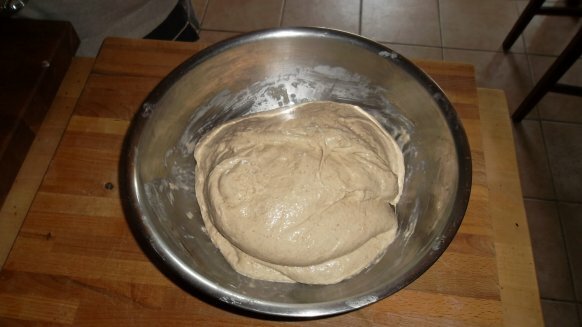 It is easier to manage the dough with less water but the flavour is better with more. I was also told that it’s better with a larger quantity, I haven’t tried making just one loaf as the biggest cost is heating the oven so baking two at once makes economic sense. 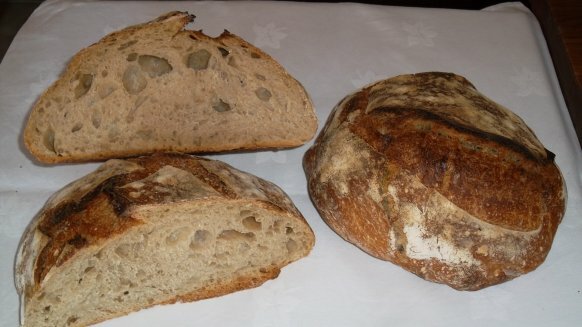 It is also a better use of time (it takes as long to make one as two) and sour dough bread keeps much better. If you prefer you can always put one in the freezer. 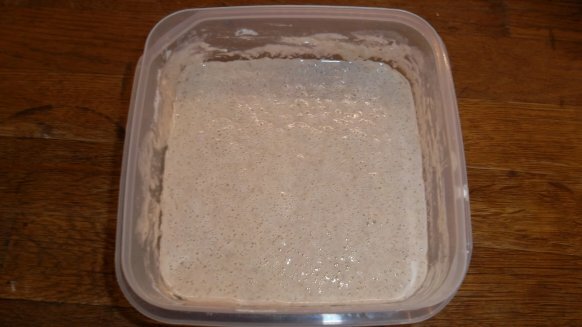 Happy Sour Dough Starter Bubbling Away. 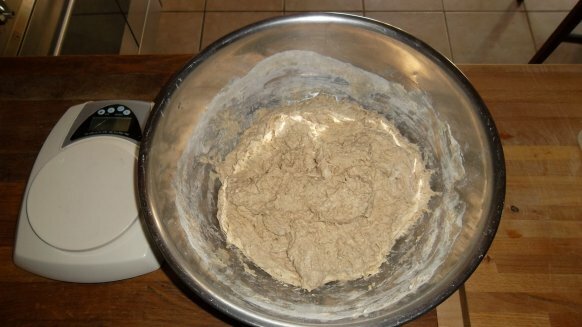 If you are not planning to bake keep the starter in the fridge and feed it once a week. 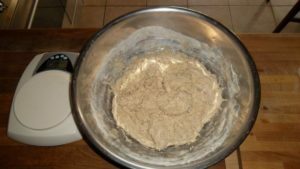 To feed weigh equal measures of starter (say 30g or more) mix with an equal weight of water then add an equal weight of flour, mix well and return to the fridge. If you are planning to bake. 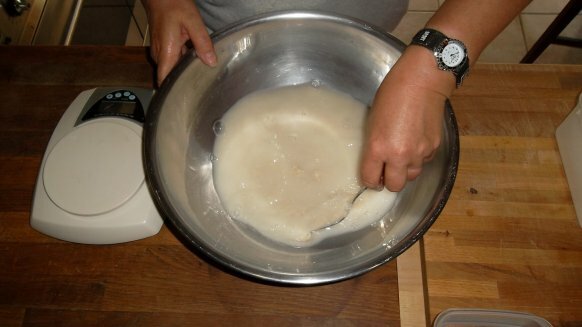 Remove from the fridge take 50g of starter and add equal amounts of water and flour as above. Leave out of the fridge for about ½ a day and then feed again using 100g and leave until active i.e. lots of bubbles. The time this takes will vary with temperature, the warmer the quicker but the flavour will be better if it’s not too warm. Mix well and transfer to a clean oiled bowl and leave for about 40 mins. Do the first fold. This involves wetting your hand working it between the bowl and the dough then lifting and stretching the dough and folding over on itself. Turn the bowl and do it again until you have worked your way all round the bowl, say 4 or 5 folds. 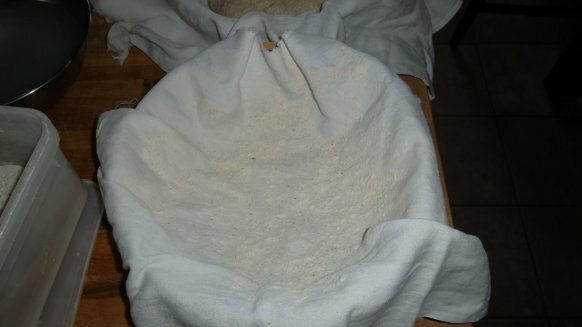 Then get your hands under the dough on either side lift it so it folds in half then turn the bowl a ¼ turn and do it again. Leave for about 40 mins. Do 4th fold and leave for about 1 hour – it should look like it’s doubled in size. Flour the worktop and turn the dough out of the bowl have a jug or a bowl of room temp water to dip your hands in so they don’t get to sticky. Use a dough scraper to cut the dough in half and shape each half by scraping the dough round and under so you have a round shape and the top is tight and smooth a bit like a balloon. Leave for 15 to 30 mins for them to relax. 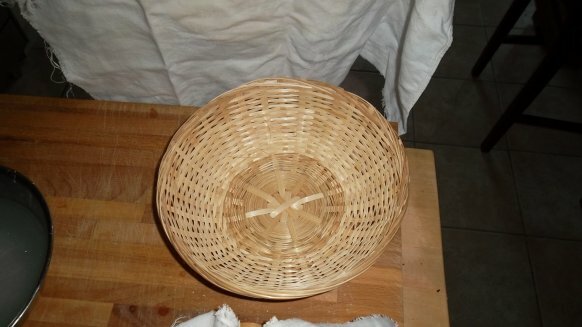 Prepare your proving basket, or in my case a round bread basket lined with an old tea towel. You need to make sure there is plenty of flour on the tea towel or in the basket. You can use any bowl or basket that is the right shape. when you poke the dough it should spring back into shape straight away. You can now bake your bread or put the basket in a plastic bag and leave in the fridge over night. Next morning put two cast iron crocks with lids in the oven and preheat to 250 °C for about 40 mins to an hour. Take the dough out of the fridge. When the oven and crocks have heated turn the dough out on to baking paper (this makes it much easier to get it into the very hot crocks) and using either a Stanley type knife or a serrated knife score the dough. Then lifting by the paper drop them into the crocks put the lids on and put them in the oven. Turn the oven down to 220 °C and cook for 40 mins then remove the lids and cook for a further 10 to15 mins. You might want to play around with the cooking times as all ovens are different but don’t worry if it looks a dark or even burnt, as we discovered it actually tastes fantastic! When I first thought about writing this blog I thought about the things we do and writing about them, I didn’t really think about how you start until I sat in front of the computer. 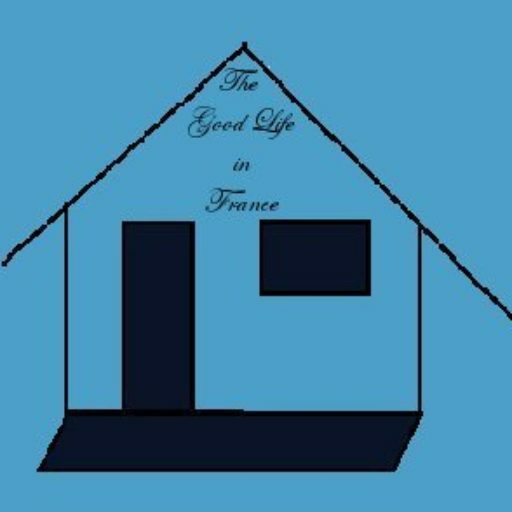 I could start with why we wanted to move to France and how we managed to do it, then take you through our lives in France so far, but that would make for a very long blog so I’ve decided that I’ll fill that detail in as we go along. 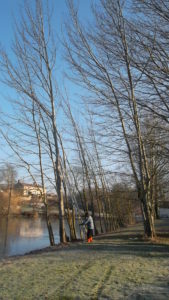 Currently we live at Les Soudieres, 1.4 hectares of countryside with a lake, or a pond, depending on your point of view. Either way it’s about an acre of water surrounded by trees. 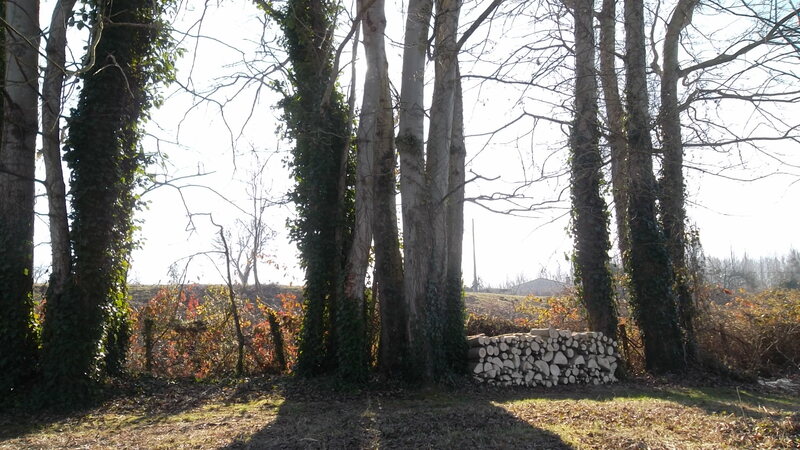 In fact there are a lot of trees on the property and as anyone who has trees knows that means a lot of ‘managing’. 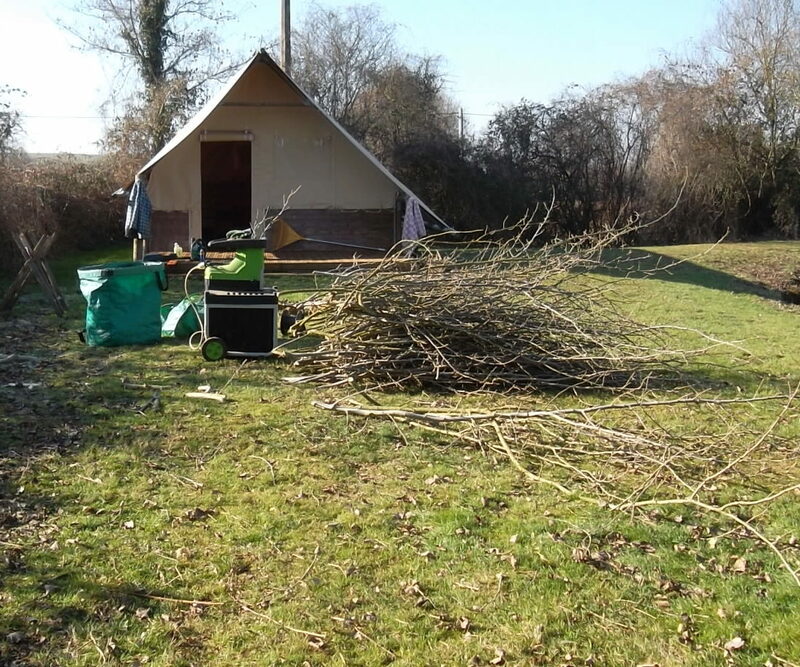 We started this job with Andy and Maggy, friends who come out for Christmas bring chainsaws, billhooks etc., as you do when you are going on holiday! 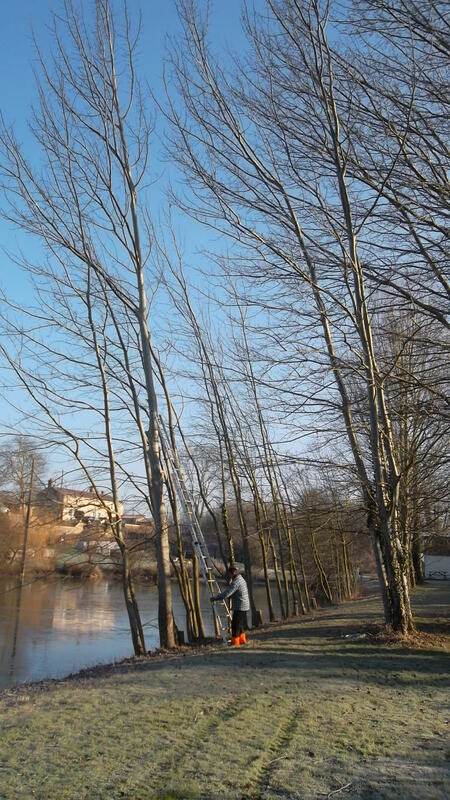 One cold (for cold read freezing) sunny morning last week we de decided we needed to finish taking down the Populars at the very edge of the lake, one of which was very tall and leaning slightly over the lake towards the electricity cables – what could possibly go wrong? We are not as rash as that makes us sound, just out of sight in this photo is a mini tractor with a winch and Steve is about to secure a wire high up in the tree so I can winch it as he cuts. 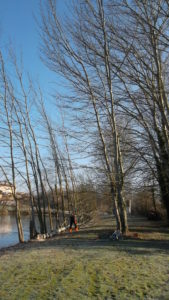 We have also left the smaller trees along the edge of the lake so that if I can’t winch it fast enough they will stop it falling in the lake. Well I wasn’t able to winch fast enough but the trees did their job and as you can see below it’s on the deck and not in the lake and the electricity is still connected too! They say with wood it warms you twice, once when you cut it and again when you burn it. 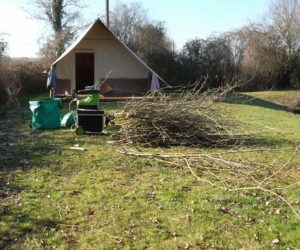 We like to make our wood work much harder…. 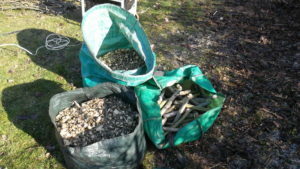 The twiggy bits are put through the chipper, always my best friend when we are doing tree work – the alternative is several trips to the tip, plus we put the chippings on the paths to keep them mud and weed free. The smaller ‘logs’ are seasoned and used for the glamping lodge fire pits. 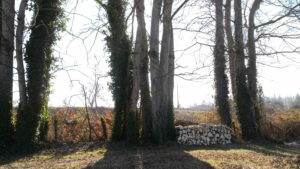 The bigger logs are stacked in metre lengths to season, the best place to stack them is between two trees. The problem is that the best distance is also the best distance for a hammock. Now given that the lake is frozen and it’s pretty darn cold, we’re not going to hang a hammock, but you do need to plan ahead. As you can see we found the perfect spot #goodlifeproblems.